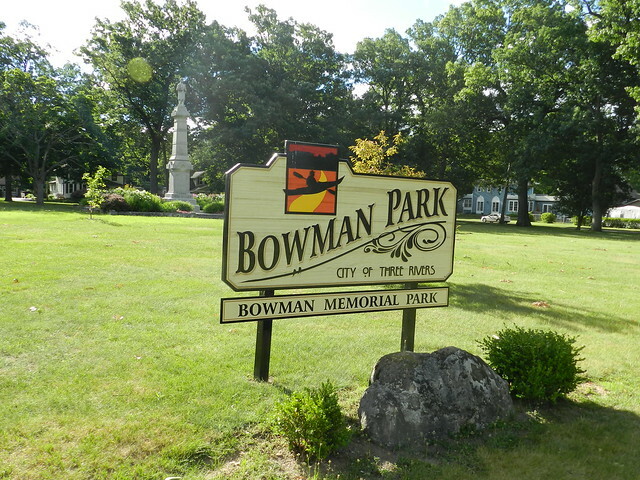 Bowman Memorial Park commemorates the historic past of Three Rivers and one of its founders, John H. Bowman. Land originally granted to Mr. Bowman by the United States government in 1832 was platted by Mr. Bowman, with Lot 31 becoming a cemetery for the family and other early settlers in 1836. Decades later some of the markers and graves were moved to Riverside Cemetery. One can still see the grave marker of Caroline Fellows Bowman Winn, a sister-in-law of Mr. Bowman and a daughter of an American Revolutionary War soldier. It was placed by the Daughters of the American Revolution (DAR) in 1915 to ensure that this land remains a cemetery and a permanent memorial to John H. Bowman. The Civil War Memorial Statue in the middle of the park was dedicated to the soldiers of the Michigan 11th and all who fought in the Civil War. It was first erected downtown at Main and Michigan in 1893, but was moved to Bowman Park in 1928.